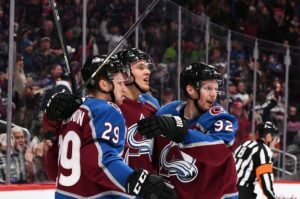 With the first 10 games in the NHL season complete, many offensive first lines have showed a lot of promise, with players connecting with each other in a way that makes it almost impossible for opposing teams to play against. These are the top five lines to play together in the league so far. due to their first line. The rest of the team has not performed amazingly, but this first line of quick, skilled players have kept their team in it so far. 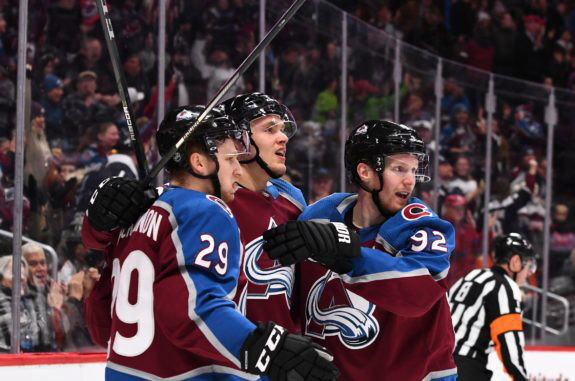 Mikko Rantanen leads the league in points with 24 and is the reason his line-mates Nathan MacKinnon and Gabriel Landeskog have been able to score at an amazing pace. Over the past two years, MacKinnon has made himself into one of the best power forwards in the league. In total, the line has 63 points, more than any other in the NHL and has been terrorizing other teams’ defense this season. As per usual, the Flames look like they’re indeed on fire as the league’s top team with small unbeaten runs, but carry on to be ice cold this year. Mike Smith can stop 50 pucks a night and be the guy the Flames expect him to be, or get yanked. But we could get more mediocre performances from backup David Rittich whenever Smith is not playing to par. The Flames are sitting at the top of the Pacific at 9-5-1 but if you take away their current four game win-streak, they would be hovering at .500. The newly formed trio of Johnny Hockey, Monahan and Lindholm are leading the team first, second and third in points combining for a deadly 54 points. These three could be what Calgary needs to get over the hump and get out of the Wild Card fight in the west, but Calgary will also need consistent defensive performances to compensate the top-line’s production if the Flames want to be the breakout team of the season. The Boston Bruins are having a great start in a competitive division this year. They are sitting in second place with 16 points, tied with Montreal and Toronto, and have had good performances from their top and depth players. Their first line has been nothing short of spectacular. Veteran centre Patrice Bergeron is once again a major presence on the faceoff dot with 12 assists and 19 points in only 12 games… Nothing short of amazing. They have also seen great performance from their leading scorer Czech star David Pastrnak, who has 11 goals and 16 points; he has made a name for himself as one of the top scorers in this league. Power forward Brad Marchand has had a great performance this season, with 11 assists and four goals. Being a great depth player on the line, Marchand is able to do almost anything he’s asked to do. The Nashville Predators have had an amazing start to the season, leading the league in points. They have had outstanding performance from all the lines, including their powerhouse defensive core. They have also seen good performance from their top line, who are picking up where they left off last season. Filip Forsberg has had amazing performance these past few seasons, establishing himself as a household name. He is tied in fifth place with 10 goals and has four assists. Ryan Johansen has a good-looking 13 assists and 15 points to lead the team’s offense. Meanwhile, Swiss forward Kevin Fiala, has filled in the power forward role, rounding the line with this ability to create opportunities out of empty space. If the Predators keep up their consistent team performances while being lead by this trio, they are going to be looking at another Stanley Cup run. Washington was not off to a great start last year, but were able to pick it up midway through the season and produce a Stanley Cup winning performance. They are looking to do the same this year, under the guidance of their top three. Not only have they not had the best goaltending from their star net-minder Braden Holtby, they have been let down by some of their depth players that were so important to them in last year’s playoff run. However, their top line is something they can be proud of. Alex Ovechkin is once again off to a great season start and he doesn’t look like he’s cooling off anytime soon. They haven’t gotten the best play from Jakub Vrana, who has only produced six points, but has been able to add depth in terms of being the role player to the first line. Vrana will create more space for Ovechkin and Evgeny Kuznetsov to move around and produce. Watch out for the Capitals, as they will look to make a playoff push as soon as they can.